This picture was taken in January 1963 and shows workers from Wickhams on the frozen River Lea. 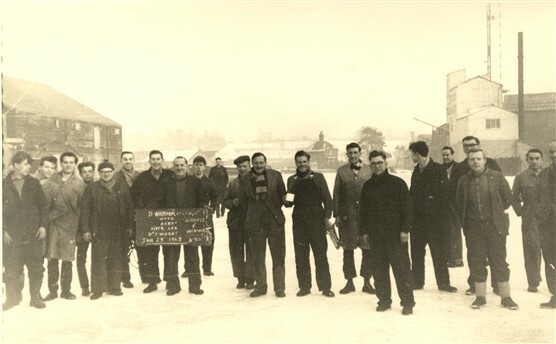 Included are Melvin Baker (4th from left), Mr Roberts (with striped scarf) and Mr Gold (standing with a mug of tea). The back of Wickhams old shop can be seen on the right. Albany’s warehouse on the left, and in the centre at the back you can see Ware lock. They are about to have a football match – a half past three kick off. Does anyone know who the other people in the picture are? I worked in the machine shop from 1945 till 1953 . Most of the period with Bill Roberts in the Machine tool maintenance dept. Remember many of the people in the photo.